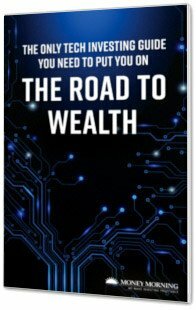 When it comes to investing, the road to wealth is paved by tech. Case in point: When Amazon.com Inc. (Nasdaq: AMZN) went public in 1997, its shares were priced at just $18, compared to nearly $1,600 today. But that doesn't account for the stock splits along the way. In fact, it would have taken just $570 invested in AMZN at its IPO price to give you a total of $1 million today. Those returns, according to The Wall Street Journal, have made Amazon the most profitable U.S. stock since 1926. Of course, Amazon isn't the only tech company that's crushing the rest of the market. In fact, four of the five biggest wealth-creating stocks in modern history have been tech-oriented stocks. 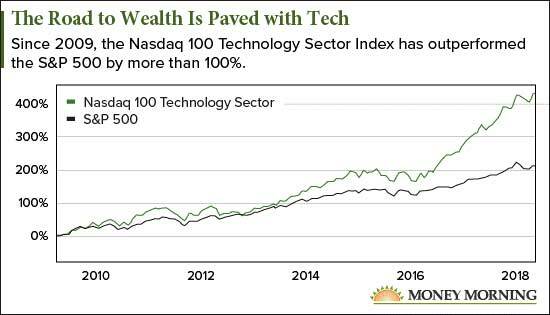 More recently, the Nasdaq 100 Tech Index has outperformed the S&P 500 nearly twofold - with a 432% gain versus a 213% gain - since 2009. And that's just an average of these 100 companies. The best of them are performing even better. Put simply, if you want to crush the market, you invest in tech. You also establish the right guide to help you separate the winners from the losers. That's where Money Morning tech investing expert Michael Robinson comes in. Michael is a 34-year Silicon Valley veteran and one of the top tech financial analysts working today. In his time covering technology investing for Money Morning, as well as serving as the editor of Nova-X Report and Radical Technology Profits, Michael has delivered one winner after another. FleetCor Technologies Inc.: Up 83% since Michael recommended it in April 2014, compared to 48% for the S&P 500. Sirius XM Holdings Inc.: Up 97% since he recommended it in December 2013, compared to 50% for the S&P 500. Intuit Inc.: Up 78% since he recommended it in July 2015, compared to 30% for the S&P 500. Activision Blizzard Inc.: Up 124% since he recommended it in October 2015, compared to 38% for the S&P 500. Illumina Inc.: Already up 28% since Michael recommended it six months ago, compared to just 6% for the S&P 500. These winners are the result of five simple rules Michael has developed in order to identify the companies that can deliver big returns. Armed with these five rules, he'll guide you to the same winning returns in the coming years.